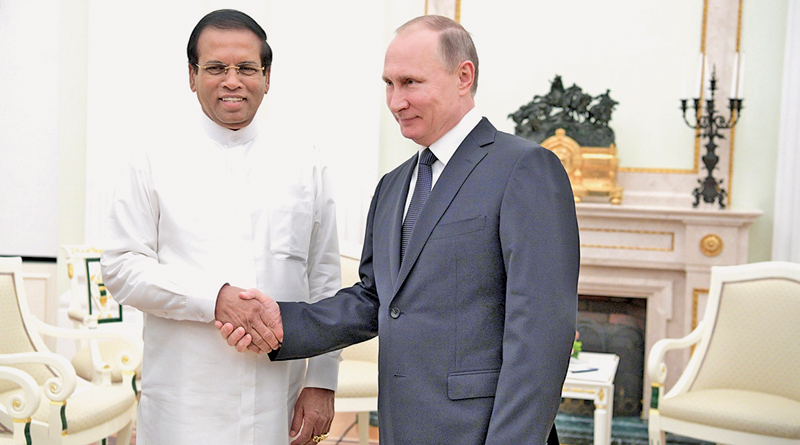 Russian President Vladimir Putin with President Maithripala Sirisena at the Kremlin. Can you think of two personalities more contrasting than former President Chandrika Bandaranaike Kumaratunga and President Maithripala Sirisena? Few who are in favour of the former endorse the latter and few would see anything in common between them, especially today. But critics of President Sirisena do not stop to ask themselves why as President, both personalities did the very same thing to the very same Prime Minister—in 2003/4 and 2018 respectively! Surely the question is why did this happen and the ancillary question is why does no one ask the question? Logic teaches us that when two different factors behave in the same way towards the same single factor, then it shows you something about that single factor. To put it more formally, when there is a constant amidst two variables; when the same outcome occurs in two different contexts, then the focus has to be on the constant factor/s, not about the variables. The main constant factor was Ranil Wickremesinghe as Prime Minister. The other constant was that both Presidents, CBK and MS, headed the Sri Lanka Freedom Party. So the preliminary answer is a simple one. 15 years apart, the SLFP under two wildly contrasting leaders, reacted in exactly the same way, and in the same way to the same personality, Prime Minister Wickremesinghe. The SLFP leader of the day, then (15 years ago) and now (15 years later) who happened to be the elected President, followed suit. In policy terms Mr. Wickremesinghe behaved consistently and the SLFP too reacted consistently to the same stimuli. He behaved then, in 2001-2004, and now, in 2015-2018, in the same way. That way, Wickremesinghe’s Way so to speak, inevitably generated a backlash in the SLFP, especially at its base. In 2001-2004, the SLFP and the JVP joined hands to campaign for the ouster of Prime Minister Wickremesinghe and the UNP government. President Kumaratunga and ex-Foreign Minister (he was briefly her International affairs advisor) went to Delhi and briefed the Indian Establishment about the CFA and how it jeopardized both Sri Lankan and Indian security. India had already replaced the dovish High Commissioner Gopalkrishna Gandhi with the pronouncedly anti-LTTE Nirupam Sen. The main campaigners domestically for the PM’s ouster were the moderate Anura Bandaranaike and Mangala Samaraweera and the radical nationalist Wimal Weerawansa. The same thing happened this time around. Obviously the SLFP is allergic to either the UNP generically or the consistent policies and profile of Prime Minister Wickremesinghe in particular. If Mr. Ranil Wickremesinghe were electable as President, a coalition would not have been needed, but he proved repeatedly that he wasn’t. Thus the imperative arose of a common candidacy and a coalition with the SLFP or a faction of it. This in turn opened up the inevitability of an SLFP rebellion against him sooner or later. This would have been avoidable if the UNP had replaced him with another, more centrist and organic leader. That would have given the party two options. Either a credible run at the Presidency in 2015 or a more consensual relationship with the SLFP had it entered a coalition government. The UNP chose to stay with its present leader notwithstanding the fact that it had been out of the slot of the country’s top leadership i.e. the executive presidency, since 1994. The last chance to save the 2015 coalition was the no confidence motion. President Sirisena tried to continue the coalition with a new UNP leader or to defeat that leader in a Parliamentary vote. The UNP chose to spurn that opening. The neo-liberals and the liberals thought that the ‘unity’ coalition, the influence of the former President (CBK) and the 19th amendment was a firewall against the repetition of the 2003-4 outcome of ouster. They were wrong. These constituted a flimsy firewall against the sentiment at the base of the SLFP. That sentiment was aptly demonstrated by the success of the SLPP at the Local Government election. It is nonsense to argue that the SLFP is incorrigibly racist. Why then did the SLFP rebel against the UNP Prime Minister of 2001-2004 when the party was under the liberal, if not neoliberal leadership of President Kumaratunga and why did she feel compelled to go along with it? The fact is that the SLFP has been in office since 1994, that’s almost a quarter of a century. It goes with what works with the voters, in order to secure an electoral victory. It felt that Prime Minister Wickremesinghe’s policies then and now were deeply unpopular. In 2001-2004 that unpopularity redounded to the credit of the SLFP in Opposition. This time around it saw that it was being dragged down the unpopularity of his policies, because the SLFP was its coalition partner and in the meanwhile the breakaway SLPP was doing vastly better electorally. If the UNP partner’s policies were working on the ground, at the grassroots, the more populist-nationalist SLPP would not have instantly outstripped the SLFP and the SLFP would not have rebelled because it would have felt it more pragmatically utilitarian to remain in office with the UNP. All that the current leadership finally did was the reflect and respond to this pressure of social and national outrage from below, just as President CBK did 15 years ago. A different UNP leader—more realistic, more flexible, more socially sensitive, more populist, more patriotic, less tarnished and tainted by the Bond scam -- may have not caused such an erosion of its own electoral base and a worse one in the base of its SLFP partner and thus generated such a backlash from the SLFP. 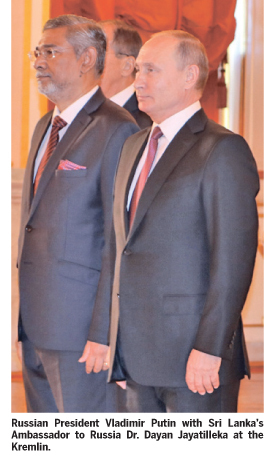 No one (possibly apart from his ex-Finance Minister, ex-Foreign Minister) has as big a target profile that he has. So instead of lamentation and hysteria, the wailing and gnashing of teeth, place the blame if one must, for his overthrow at the correct doorstep—his own and those who kept him in place and in play. What happened was inevitable and predictable. Firstly it had happened before, in 2001-2004, especially 2003/4. Secondly, this time around, there was also a visible global phenomenon of the sharp swing against neoliberal globalization and towards patriotism, nationalism and populism of one or another sort (Right, Left or Center). And yet, the UNP (with a single prominent youthful exception who was lustily cheered at its recent demonstration) and Colombo’s civil society including academia and professionals, did not figure it out. How could they be quite so obtuse? At the heart of the current debate is the issue of national and people’s sovereignty, on the one hand, vs. the supremacy of the Legislature on the other. This debate is based on a monumental misperception. There is a complete misunderstanding of the Constitution. Some inhabit a mental universe in which Sri Lanka has a Westminster model, i.e. a parliamentary system or preponderantly parliamentary of government. It does not. It has a mixed system which is predominantly an executive Presidential system. The dice is still laden in favor of the Presidency. It is very true that the 19th Amendment imposed certain fetters on the Presidency. However, the 19th Amendment is not a new Constitution. The 19th Amendment is by definition, a modification of the existing Constitution. That modification is a structural change, not a system change. It is delusional and absurd that some behave as if we have a new Constitution—a project which was indeed on the neoliberal agenda but has so far failed. The political or state system—the model– is eminently classifiable under the category (or ‘chapeau’, in diplomatic language borrowed from the French) of ‘Presidentialism’. “The Gaullist System in Asia”, as Emeritus Professor of Political Science AJ Wilson defined the 1978 Republican Constitution in a 1980 volume, still remains as some credentialed critics termed it at the time, Gaullist-Bonapartist, though with important modifications which make it neo-Gaullist or quasi-Gaullist. The Constitution has to be viewed holistically. The totality is greater than the part. A Constitution cannot be reduced to a single amendment or viewed through the prism of a single amendment. For instance, the Constitution is irreducible to and cannot be perceived through the keyhole of, the 13th Amendment of 1987. As with the 13th Amendment so also the 19th Amendment. The 19th Amendment has modified but not abolished the logic of the 1978 Jayewardene Constitution. The logic of that Constitution is, in the words of its architect, “a strong and stable executive free from the whims and fancies of the legislature”. While the 19th amendment renders it less free from the whims and fancies of the legislature than it was, the executive still remains above and relatively autonomous of the legislature. The logic of the 1978 Constitution is that the country is a Republic, which means that the people are sovereign, and the sovereignty of the people, in its executive aspect, is exercised through a Presidency which is directly and democratically elected by the people as a whole, and in which the Office of President cannot be held by anyone who has failed to obtain a majority (50.1%) of the popular vote. This is why the Presidency is placed decidedly above the Prime Minister: The President is elected by the whole people and is therefore the more authentic agency of popular sovereignty. The executive function is that of making decisions, not framing laws. Framing laws is by the legislature. Making decisions is the function of the Presidency which derives its legitimacy from having been elected by a majority of the people as a whole, unlike others elected on a far more restricted base. The centre of gravity of that Constitution is the Presidency, not the Prime Minister or the Parliament. One cannot “continue to govern…as per the Constitution”, against the President. Such an attempt is the real ‘coup’. The Head of Government is also the President. The President is not a mere ceremonial Head of State. To shift from the issue of the Parliamentary arithmetic to that of state power as such, here the legislature remains disadvantaged, irrespective of the 19th Amendment. It is here that the heart of political power and indeed the reality of politics itself, lie. No political scientist would confuse the ‘State’ and the ‘Government’. Nor would he/she assume that the two could be placed on par, leave alone envisage a scenario in which in a clash, the Government overrides the State. If the Government defies the State, the State intervenes to override the Government. The Government is not the State, and is certainly not superior to the State—it merely manages the day to day affairs of the State. It is the State that in the ultimate analysis, determines the Government and not the Government, the State. The President, as the elected executive, is not only the Head of State and Head of Government, he is much more crucially, the Minister of Defence and the Commander-in-Chief of the Armed Forces.